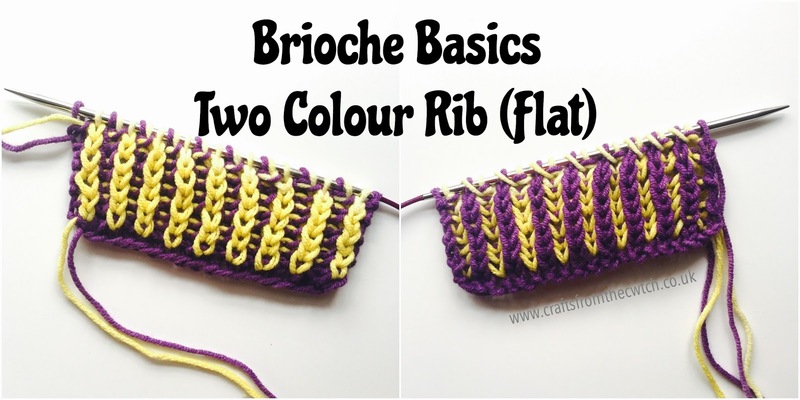 In the previous instalment of this 'Brioche Basics' series, we looked at knitting two-colour Brioche rib in-the-round. If you missed the series, you may like to view it here before proceeding (or this post may not make sense). Now it's time to look at two-colour brioche knit flat / back-and-forth. The big difference is that you need to work each side twice before turning the work - once with the dark yarn (DC) and once with the light yarn (LC). For this reason, when knit 'flat', two-colour brioche must be worked on double pointed or circular needles. The result is a fully reversible fabric with a dark side and a light side. On the dark side of the work you will brioche knit (brk) the dark stitches and brioche purl (brp) the light stitches, and on the light side, the opposite is the case. And as one colour (in this example the DC), is used for the edge stitches, it's necessary to prevent the other (LC) yarn getting tangled along the edge by moving it to the front or back of the first and last stitches as you work, so that the LC is always left on the light side of the work. It might sound a bit complicated, but once you get into the swing of things, it all makes perfect sense. Of course the best way to understand it is to give it a try, so grab your yarn and needles and let's get to it! Sl1yo - Brioche yarn over: put the working yarn to the front of the work, slip the stitch from the left to the right needle and put the working yarn over the top of the slipped stitch (photos and video here). Brk - Brioche knit: knit the slipped stitch and it's paired yarn over (from the previous row) together. Brp - Brioche purl: yarn to the front, purl the slipped stitch and it's paired yarn over (from the previous row) together. Do not turn - at the end of the row, do not turn the work. Instead, slide the stitches back to the other end of the needle to work them again. Turn - at the end of the row, turn the work. 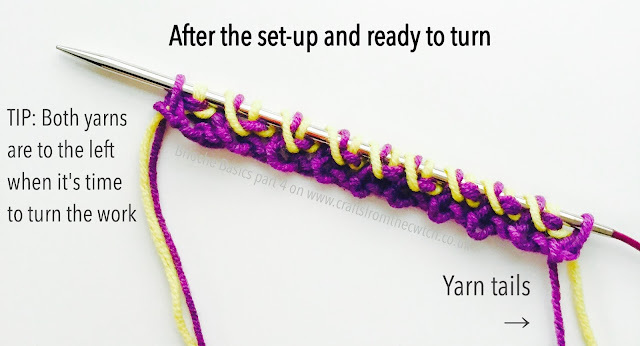 Yarn forward/back - this instruction relates to the working yarn placement so that it is always in the correct place to work the following row. Note that, as the fabric is reversible, I've used 'dark side' and 'light side' in place of 'right' and 'wrong' side. You can identify which you are working on by the columns of prominent knit stitches which are visible on each face of the fabric. Cast on: Using 4mm needles and DC, cast on 19 sts (or any odd number), then switch to 3.5mm needles to continue. 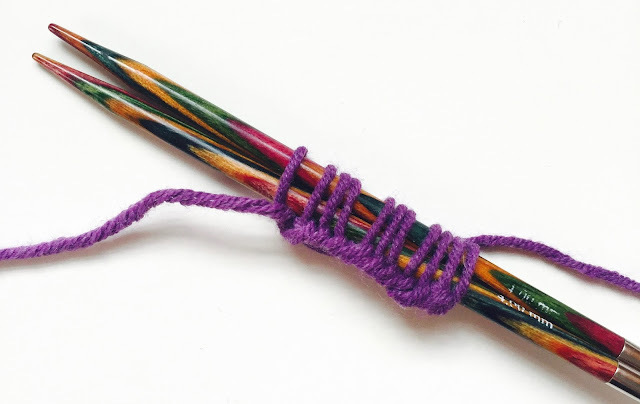 TIP: If you are a tight knitter and struggle to cast on loosely, you can hold both needles together and use them as one, for a long tail cast on, as pictured. Once you have the required number of stitches, remove one of the needles to continue. Set-up row DC: *K1, sl1yo; rep from * to last st, k1. Do not turn. Set-up row LC: Sl1, *brp, sl1yo; rep from * to last st, yarn to the back, sl1. Turn. The colours have been brightened in this image to make it easier to see the stitches. Light Side DC: P1, *sl1yo, brp; rep from * to last st, p1. Do not turn. Light Side LC: Sl1, yarn to back, *brk, sl1yo: rep from * to last st, yarn to front, sl1. Turn. Dark Side DC: K1, *sl1yo, brk; rep from * to last st, k1. Do not turn. Dark Side LC: Sl1, yarn to front, *brp, sl1yo; rep from * to last st, yarn to back, sl1. Turn. When the work measures around 10cm, or when you can read the knitting and understand the process, knit one row (all knit sts) using DC, then turn to bind off loosely using the bigger needles. 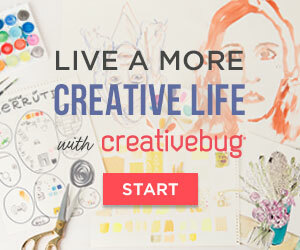 Once you are comfortable with this you'll be ready to move onto shaping and all sorts of interesting projects. I'm working on a simple triangular shawl which uses the 'brkyobrk' increase and will be back with that soon. If you can't wait to learn more about this technique, check out Nancy Marchant's essential Brioche book, or one of her Craftsy classes (affiliate links). My thanks to Scheepjes for supporting this 'Brioche Basics' series - in the UK, Scheepjes yarns are stocked by Deramores and Wool Warehouse, who also ship internationally. Hi Linda, it's different depending on whether there is an odd or even number of stitches. 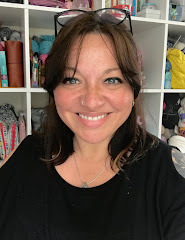 For this tutorial I used an odd number, but you shoudl find plenty of help from Nancy Marchant - there are tutorials on her website which go into much greater detail, so I'm sure you'll find the information you need there: http://www.briochestitch.com/ Good luck!